Arab leaders have warned US President Donald Trump that moving the American embassy in Israel to Jerusalem could have dangerous repercussions. Mr Trump phoned several regional leaders on Tuesday to tell them he intended to move it from Tel Aviv. Saudi Arabia's King Salman told the US leader that any such move would provoke Muslims around the world. The calls came amid speculation that Mr Trump could recognise Jerusalem as Israel's capital on Wednesday. He is scheduled to deliver remarks and White House spokeswoman Sarah Sanders said he was "pretty solid" in his thinking on the issue. The city's fate is one of the thorniest issues between Israel and the Palestinians. If Washington recognises Jerusalem as Israel's capital, it would be the first country to do so since the foundation of the state in 1948. 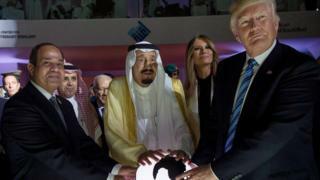 King Salman told Mr Trump that the relocation of the embassy or recognition of Jerusalem as Israel's capital "would constitute a flagrant provocation of Muslims, all over the world", the official Saudi Press Agency reported. Meanwhile, US government employees and their families have been barred from personal travel in Jerusalem's Old City and the West Bank for security reasons ahead of planned protests. Palestinian leader Mahmoud Abbas "warned of the dangerous consequences such a decision would have to the peace process and to the peace, security and stability of the region and of the world"
Egypt's President Abdul Fattah al-Sisi urged Mr Trump "not to complicate the situation in the region"
Official statements from the Palestinian Authority and Jordan confirmed that Mr Abbas and King Abdullah were told of Mr Trump's intention to move the embassy, while the Saudi reports did not say so explicitly. None of the leaders said if Mr Trump had specified when the embassy move would take place. He promised the move during his campaign for the presidency. Israel regards Jerusalem as its "eternal and undivided" capital, while the Palestinians claim East Jerusalem as the capital of a future Palestinian state. Reports suggest Mr Trump will sign a waiver to keep the embassy in Tel Aviv for six more months, while committing to a move. The White House only said the president discussed potential decisions regarding Jerusalem with all the Middle East leaders he spoke to on Tuesday, including Israeli Prime Minister Benjamin Netanyahu. Earlier, Turkey's president Recep Tayyip Erdogan warned his country could sever ties with Israel if the US recognised Jerusalem as its capital. Ismail Haniya, the chief of the Islamist Hamas group that runs Gaza, said a shift of the embassy and recognition of Jerusalem as the Israeli capital would cross "every red line". France, the European Union and the Arab League have also spoken out to express concern. Israel's intelligence minister Israel Katz told Army Radio that he expected Mr Trump would recognise Jerusalem as his country's capital and said that Israel was "preparing for every option", including an outbreak of violence. What is so contentious about Jerusalem's status? The status of Jerusalem goes to the heart of Israel's conflict with the Palestinians, who are backed by the rest of the Arab and wider Islamic world. The Palestinians claim East Jerusalem as the capital of a future state, and according to 1993 Israel-Palestinian peace accords, its final status is meant to be discussed in the latter stages of peace talks. Israeli sovereignty over Jerusalem has never been recognised internationally, and all countries, including Israel's closest ally the US, maintain their embassies in Tel Aviv. If the US recognises Jerusalem as Israel's capital, it would reinforce Israel's position that settlements in the east are valid Israeli communities.